Pony Club Updates and results can be found on the 'Pony Club' page. Our The Pony Club team of Daisy & Casper, Evie & Chip and Jess & Betty were competing at Somerford Park. It was their first ever time Eventing and they did a fabulous job! All three did a good dressage test, then jumped clear showjumping and then Daisy and Evie also jumped lovely clears cross country with Jess also doing really well with just one blip at the end due to tiring (after all it had been a long day!). Our team (the only Centre competing) finished 9th in a super competitive class and we couldn't be more pleased with them. No rosettes today but one of the nicest days we've had and in our eyes one of the most successful. Well done girls! Thanks also to our old Pony Club members Laura and Gemma for coming along to help and support; to all of the volunteers working there today including our own Lucy and finally to East Cheshire Branch of The Pony Club for putting on such a great day. Well done to Ada, Michael and Phoebe who represented CPRC up at Osbaldeston on Sunday 18th. They finished a very credible 8th out of 17 teams! We were very proud of all of their horse knowledge! A huge well done to Phoebe and Ella who took part in their first ever race at Haydock Park Racecourse on Sunday 7th May. They were both in the same (very competitive) race of seven starters across 4 furlongs. Phoebe and Sparky raced home to finish 2nd and Ella and Kiki were not far behind at all finishing 4th! This is an amazing achievement for both of them and we would like to thank Carrie and the continued support of the Pony Racing Authority for taking our members on their great scheme. We set off to Warwickshire College to the British Horse Society National Riding Schools Championships with 8 riders from CPRC who qualified at our competition earlier in the year. 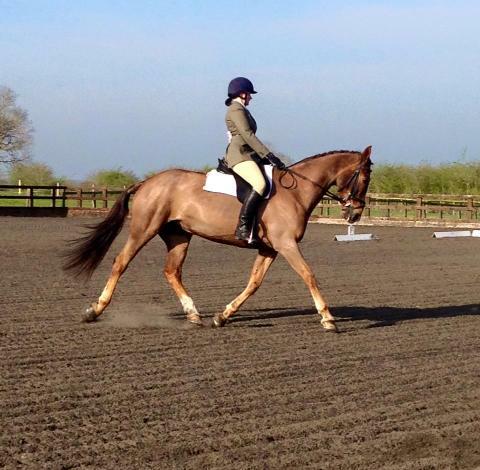 They were judged on their dressage test, style over a course of jumps and an equestrian quiz. We had a pretty hectic start- with transport issues so we had to borrow one horse from Moreton Morrell College (a lovely horse called Magic), we also had planned to take Sugar but she was injured so we swapped her for Betty, and finally the massive traffic queue on the morning meaning that we left Croxteth at 5.15 and arrived there at 11! Thanks to the organisers for understanding our situation and pushing our dressage times back to allow all to compete! Phoebe riding Betty finished 3rd in her section, Evie and Chip were also 3rd in theirs and in the 18 & Overs Lisa and Pip won with Lucy in 4th and Heather in 7th both on Magic! This meant that our team from CPRC WON the National Riding Schools Championships!!! Thanks to all of our riders and their families yesterday for their hard work and support. We are very proud. A big well done also to Viv, Christina and Melissa for coaching so well! A big well done to Ruby A, Ruby W, Poppy & Michael (pictured below) who all received their certificates from the PRA. We are also excited and very happy to announce that we have another 4 starting the scheme. So, good luck to Ella, Jess, Phoebe and Charlotte! Thanks once again to the PRA for all of their help and giving our members this opportunity. This year Melissa and Christina represented us on the Ride Into Liverpool on Cassie and Dippy who thoroughly enjoyed their hack into the city centre. Dippy even got a special haircut for the occasion with a Liver Bird clipped into his coat. On the run up to the show Casper was at the Echo arena racing the shetland ponies in their Grand National with Wocket Woy & The Pwoducer (a must-see Youtube channel if you like horses and comedy! ), and he behaved impeccably. And finally, congratulations to Ella Baines who won our competition for four gold tickets to the show! We were really happy to find out that Christina has been awarded a training scholarship from the BHS to fund further training and exams, congratulations! We were very fortunate to be picked out by the Pony Racing Authority for their great new scheme of getting more people into racing. Poppy Mackin, Ruby Wood, Ruby Allan and Michael Mulhall all completed the scheme and raced this year at Wolverhampton and Beverley racecourses as well as learning a lot along the way under the coaching of Carrie Ford. We are hoping to run this again with another 4 children so watch this space for future jockeys! We have had another great summer with our Pony Club members. We have had teams at the Area Quiz, then qualifying for the final, Area Horse & Pony Care teams, Area and Grassroots dressage and showjumping teams and our Centre Equitation at the Championships teams. Notable highlights include Lydia qualifying for the championships at the area jumping, being the only centre member to do so in the whole of the UK and our fabulous Centre teams for their numerous placings and finishing team 2nd. We hosted two fun summer camps which were action packed and are looking forward to seeing more and more Pony Club members in our Centre! Well done to Abby Storey-Bates for passing her Riding and Road Safety test. If you would like to do yours then please let us know. You can pick up your dressage and jumping score sheets at the office from Tuesday onwards. Work is well under way with the school, all the fences taken down, sand away and new drainage going in! See below re opening times or call our office. We're very excited to have our new arena up and to see you all soon. We've popped a couple of photos below (click to zoom in) of the work and will continue to keep you updated. Work on our new arena is going to start on 22/2/16 therefore, there will be no lessons (day and evening) Monday 22nd-Friday 26th. There will be hacks on the weekend of 27th-28th and we hope to be back in the arena the following week (not sure which day yet) but will keep you all posted. The new surface will be fully waxed which means hopefully it will not flood or freeze over! If there are any queries please call the office on 01512209177 between 9am-5.30pm. We are currently running stable management evenings which are leading up to the BHS EHKC. This is ideal for our adults who would like to extend their knowledge, meet new people and perfect for those who are hoping to one day have their own horse! We will be running this course again in Spring, please see Viv for more details. The BHS Merseyside are running another Riding & Road Safety Course and test. There is training on 27th, 28th November and 4th December with the test on 5th December. It is all based at Formby. If you are a Pony Club member and wish to take your C Test or above in the upcoming months or if you wish to take your BHS exams at any point this is essential. Please see Viv for more details if you are interested. Congratulations to Evie & Lydia who passed the last time the course was run. Our Pony Club Centre has been very active this summer with two busy Pony Club camps (see 'Gallery') and teams out competing for Croxteth Park Centre. We have sent teams to Combined Training at Warren Farm, the Area Horse and Pony Care (practical stable management competition), Area Show-jumping- where our team finished 6th and Area Dressage with our team finishing 4th! Rebecca then qualified at the dressage for the Championships where she was the only centre member (person without their own horse) competing and finished 9th nationally. We sent two teams to the Centre Equitation at the Championships and they finished 1st and 10th with many individual successes! To finish off our summer we took three teams to an inter-centre competition at Carrington where everybody rode brilliantly and had some fabulous individual placings. It is always a pleasure to take our Pony Club members out to competitions and we thank everyone at CPRC for helping them be able to go out and compete by supporting their fund raising days! More information can be found on our Pony Club page. So pleased that Cathy from our Saturday 5pm lesson is now an Ambassador for #thisgirlcan! Find out more about the campaign locally at @thisgirlcanliv on Twitter or on their Facebook page. Please 'like' the video on Facebook and Youtube! Our Saturday 5pm lesson (Cathy, Jane, Michelle, Jennifer, Lowrie, Joelly and Helen) were all film stars this Saturday (18th April) being filmed for the #thisgirlcan campaign. They all looked great having a jump out in the field and we hope to see them on screen soon! A huge congratulations to our six riders who went to the final of the National Riding Schools Competition run by the BHS. It was an early start to Moreton Morrell for the dressage, show jumping and quiz with the combined results giving a placing. Lucy Cushion (pictured below) and Helen Redmond were both riding Vogue in the 'Over 18' section. Patrick Auth on Betty and Abbie Marshall on Pip were in the '13-17 years old' section and Ella Foster on Pip and Lydia Neve on Betty represented the '13 and Unders'. Everybody did extremely well with Lucy finishing 2nd individually, Helen 7th, Abbie 4th, Ella 4th and Lydia and Patrick just out of the placings. Our team finished a great 4th and we were very proud of how everybody rode on the day.